If you enjoy this website, and would like to see it remain open, please purchase Kate Tattersall Adventures in China. Silk with lace welts, manufactured by Pope & Plante of London and displayed at the Great Exhibition, 1851, V&A Museum. Kate acquired her stockings usually from the same hosier, and ordered knit wool made to fit of many bright colours and styles, including patterned and striped. I learned that the stockings were slipped on over the silk. ** (Of course when going out to a ball or gala affair she would have just worn hose and dancing shoes, not layers.) These stockings were worn for warmth, but also to protect the silk from the wear of outdoor boots and shoes, and to provide more padding between the flesh and stiff leather. Kate specifically ordered pairs to match her different boots, and the boots were crafted to match various outfits, along with her gloves and hats. Some stockings were embellished with lace and embroidered with silk, gold, and silver thread on the cuffs. They must have been very beautiful and yet always hidden under petticoats and long skirts. It makes me wonder if decorated Christmas stockings are based on such extravagance. 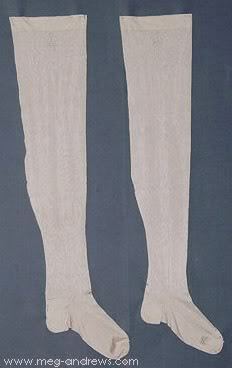 Stockings and socks from the mid 1800s, made of linen, wool, and silk with cotton, from the Metropolitan Museum of Art. Socks seemed to be a less particular purchase. They were quite inexpensive when compared to other items in Kate Tattersall’s ledger, most of wool, some cashmere. (Silk socks were also made at the time.) She wrote in her diaries about knitting socks on several occasions. Were socks just added for colder weather? Thick socks were made specifically for bed. What could be better than a thick pair of socks inside velvet slippers when rising on a frosty winter day? Her shoemaker crafted custom footwear to fit Kate’s feet, ankles, calves and shins, following every contour, and perhaps her winter boots had room for three of four layers, but that is never specifically referred to. As I quoted in the previous article, layers of socks were definitely worn, The Magazine of Domestic Economy, London 1841, recommending three or more pairs for cold weather. 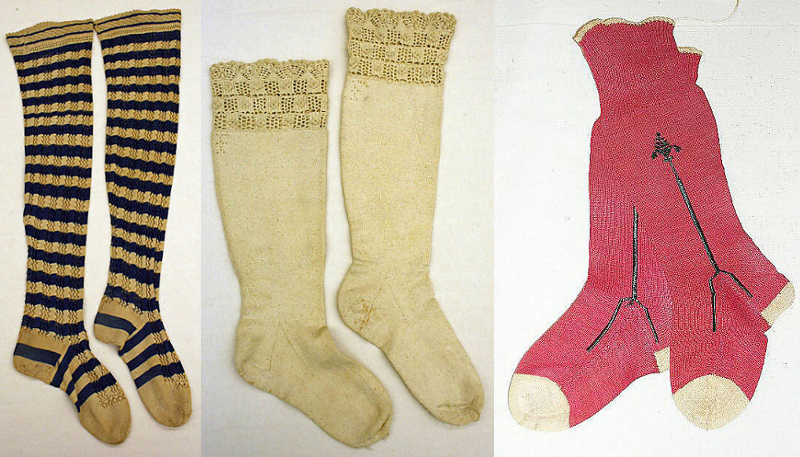 When examining quartermaster lists for general officers on campaign, their silk stockings and wool socks are listed, with funds allotted for both. This is one of those details costumers often get wrong for period pieces, as though people didn’t get cold feet in the past. There is no doubt, those who could afford them wore various layers of hose, stockings, and socks, and often possessed fur-lined winter boots. As an alternative, heavy wool socks were crafted to wear over boots, and the early rubber galoshes were based on this practical solution for cold weather. Part 2 will cover chemises and camisoles. *In 1820, Thomas Hancock patented elastic fastenings for gloves, suspenders, shoes and stockings. ** This was the same for men, wearing silk, worsted wool, cotton, or linen, and then heavy wool with their boots. 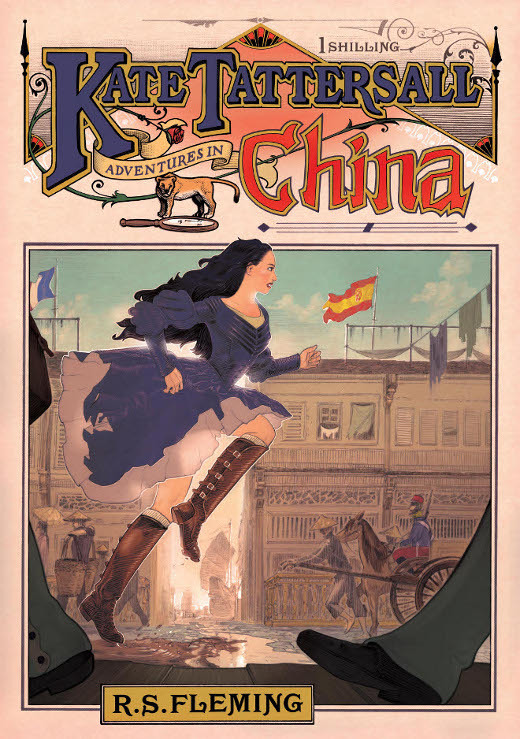 Kate Tattersall Adventures in China, Spring to Autumn 1849. And book sellers near you. Look for this sensational penny dreadful styled cover. Please consider purchasing the adventures from a local independent bookshop. This post made my day. What elegant undergarments they had. Thanks! I like this web site very much, so much wonderful information. I’d like silk hose and lace trimmed stockings. Fine way of describing, and good article to get information regarding my presentation focus, which I am going to present in school. Silk is the way to my heart!